While Reverse Osmosis (RO) water is not required to successfully keep discus, for many (not all) discus fish keepers it is an absolute necessity to breed them. Many people are intimidated by the thought of setting one up, but they are really quite easy, and quite inexpensive. A good unit that produces up to 100 gallons a day (under ideal conditions) will suffice for one or two breeding tanks. You will need this and a storage container to store and pre-heat the water it makes. When shopping for an RO unit you should be aware that you will only need a three stage unit (sediment filter-carbon block-and RO membrane). RO water for discus is not as complicated as it sounds. 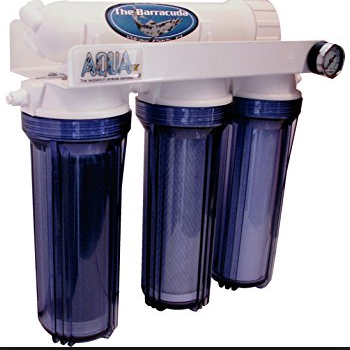 The way in which you install your RO unit will depend on where you intend to draw your water from. The most common, and easiest, is to get a garden hose bib adapter. This will screw on to a garden hose spigot and reduce to ¼ inch tubing commonly used in most RO units. Another is a saddle valve that clamps onto a water pipe and when tightened pierces the pipe and draws it water from the inserted tap. Once you have the supply to your RO unit hooked up, you will notice that there is two lines coming out of the Unit. One of these lines is for product water, while the other is for waste water. The waste water line should have a flow restrictor attached to it, and some will have the restrictor and a small valve combined. In many aspects, an RO membrane is not a lot different than a sediment filter. The primary difference is that while your sediment filter might filter down the 5, 1 or even ½ micron, the RO membrane filters down to the molecular level. They are comprised of a wound thin polyamide membrane that only lets molecules the size of water (or smaller) through and prevent larger molecules (i.e. mineral compounds found in water) from passing. The problem with filtering down to such a small level is that without a means of continually flushing the membrane, the membrane would become clogged or destroyed within a matter of minutes. This is why we have the waste water line, and the restrictor valve. As water enters the membrane, it has two options, to pass through the membrane and out the product water line, or out the waste water line. Due to the resistance of the membrane itself, all the water would flow out the waste water line if not for the restrictor valve. What the restrictor valve does, as its name implies, is to insure that the membrane is kept under pressure, yet at the same time allows water to escape. This allows purified water to move through the membrane, while allowing an escape route for water carrying the larger mineral heavy water. After you have fired up your RO unit by turning the water supply on, you should let the system run for a few hours and discard the water made. This is to insure any foreign materials or substances that might have been introduced in the manufacturing process are flushed from the system. Periodically “flush” the membrane to prolong its life, say weekly. This is easily accomplished by units with an automatic flush valve. This will help loosen mineral deposits that have built up across the membrane and flush them out the waste water line. Once every three months or so, you will want to change the sediment cartridge. The life expectancy of the membrane itself will depend on several factors, from the amount of contaminates that is in your source water, to the amount of pressure to your system, to how frequently you flush the membrane. Periodic checks with your TDS meter will tell you how well your membrane is functioning. When it gets to a level that is no longer suitable for breeding, it is time to change the membrane. I hope this article gives you a better understanding of RO water for discus.